Depending on the instrument, some pickguards may be a cinch to remove while others stick quite well and require care to avoid damage. The first thing you want to know is what finish is on the instrument and whether the pickguard adheres to finish or directly to bare wood. Most pickguards require heating to soften the adhesive prior to removal, a task that warrants caution as overheating lacquer and delicate finishes can cause them to blister and create an enormous problem. I prefer a hairdryer to soften the adhesive. 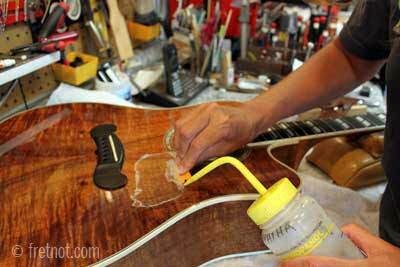 Removing the adhesive left by a self stick pickguard. 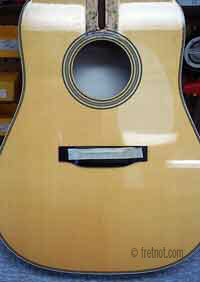 Finishes, like Taylor's U. V. cured finish and other polyester finishes withstand heat far better than lacquer and shellac. I've used a number of items to help aid the removal from a plastic putty blade to dental floss and thin fishing line. Sticky residue left behind can usually be removed with Naphtha, which would be safe on a variety of finishes though a bit slow for the more durable surfaces. Pickguards glued directly to the bare wood can cause top damage when they shrink. 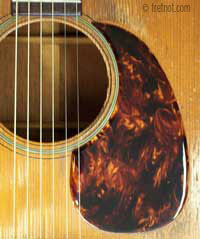 View a Martin pickguard replacement. Top did not darken beneath pickguard to correctly position the replacement, it also means that you are forced to replace the original guard with one similar or larger unless you want to see the shading. For those who don't prefer pickguards but are afraid of damaging the finish you may opt to install a clear pickguard. Clear pickguard material is much thinner than regular celluloid pickguard material and applies much like a sticker. While this can sound ridiculously easy, more experience is needed to apply these correctly than a traditional guard. The clear pickguard acts like a sticker and bubbles are sure to find their way between the material and the top if not applied correctly. I install these by floating them on a bed of water and using a squeegee to force out any bubbles before adhesion. Starting from the tip and working slowly towards the bottom, being careful to never touch the adhesive. Though these are easy to cut with scissors, the crisp factory edge that's required for a professional looking pickguard requires cutting with a template or purchasing one directly from the factory or supplier. Clear, removable pickguards are similar to the vinyl stickers that cling to glass. Most of what you'll find in the $5-$10 range today are basic, stamp cut pickguards. Luckily there are several tort and multi-colored pickguards available that give those of us who dislike the plain pepperoni that seems to be so common. Greven® pickguards by Turtleworks® happen to be my favorite replacement on vintage Martin's and those looking for unique patterns. The color on these go throughout the material as opposed to some pickguards being made today with a faux tort pattern covered by a clear top laminate. When the appropriate shape and size are not available or when creativity strikes pickguards can also be made from scratch. Using the original as a template, I scribe around the edges with an awl until a deep channel is made. 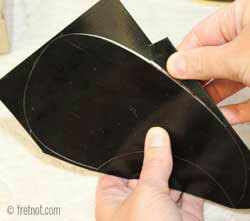 The material can then be snapped free and the edges dressed, beveled and buffed. Online retailers who specialize in pre-made pickguards have a catalog of templates and can make replacement guards even when the original is not available. Thicker pickguards can also pose a problem, a common issue is celluloid decay which causes them to crumble. It begins with a crazed, shattered like appearance which advances to the point of disintegration. These too must be replaced but unfortunately an exact material match is not usually available and we must use what's available. These are also made from thicker material, usually around .100-.125 thick as opposed to the thinner material used on many flat top guitars. They attach to the top by brackets and screws. These are obviously quite easy to remove and replace yourself. Finding replacements for these pickguards has gotten much easier as shops have manufactured templates by which they can re-make the guard using your material choice. When they do not stock a template for your instrument many will offer to make one using a tracing of the original. Want something truly personal? Most inlay artist can give your instrument a truly personal touch by inlaying a pattern of your choice into a pickguard.